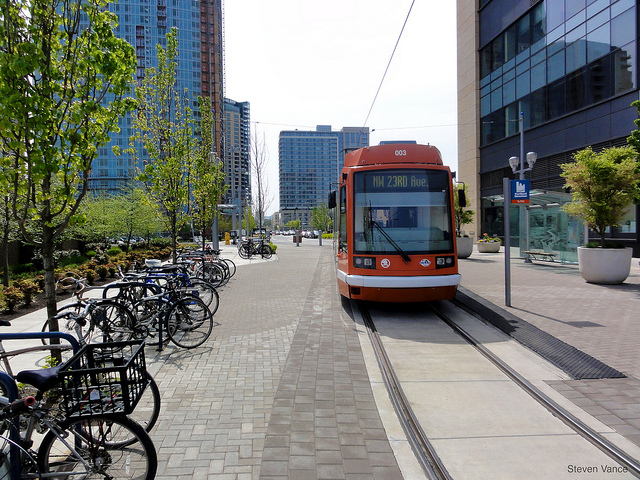 The Oregon Department of Transportation is investigating the safety issues surrounding cycling on streets with streetcar tracks. Photo by Steven Vance. A new study by travel website Frommers.com suggests that current U.S. conditions make it often cheaper to use Amtrak train services than personal vehicles for travel between cities. The study highlighted 10 city-to-city routes in the United States, including Kansas City to St. Louis, Chicago to St. Louis, New York City to Montreal, Salt Lake City to San Francisco, and Seattle to Portland. Frommers found that for the Seattle to Portland trip it currently costs an average of $36.31 dollars to travel by personal vehicle versus $31 by Amtrak’s Cascades train. Walking in nature parks can be mentally revitalizing, indicates research from the University of Michigan. When given a pause from testing to walk through an arboretum, research participants recorded 20 percent higher performance on memory and attention tests than participants who were given a pause from testing to walk through a city street. No performance improvements were detected in the city street participant group. The researchers say that the recorded mental improvements did not result from the nature exposure eliciting mood improvements but instead from engaging “involuntary attention,” purportedly a mentally revitalizing activity. Researchers at Rotman Research Institute in Toronto are expanding on the research to ascertain whether exposure to nature can be therapeutic for people with mental or emotional disorders, including depression and anxiety.